Mulled wine, a rooster on a stick, a chocolate Santa and other seasonal jolliness – it all adds up to a Christmas fair. This year, Moscow is planning over a hundred fairs, offering the chance to revel in the atmosphere of the seasonal holidays – New Year and Christmas. Many building fronts are now receiving decorative makeovers, but the Christmas fairs began trading on Dec. 23. The most unusual fair this year is the “Strasbourg Market” on Manezhnaya Square. The market received a ceremonial opening from Strasbourg’s mayor, Roland Ries, on Dec. 23 and rolled into full-scale action the following day. Around 20 wooden marquees occupy this square adjacent to the Kremlin – elaborate festive palaces straight out of a Coca-Cola advertisement. The organizers hope to summon up the traditional festivity of Europe’s Christmas markets. Visitors will find gifts, Christmas trees, toys, French pastries and much more on sale. If there is no time to head off to the merrymaking in Europe, then the Strasbourg Market is a pretty good substitute. All-Russia Exhibition Center (VVTs)– the outdoor venue still known to most as VDNKh (the Soviet Union’s “Exhibition of Economic Achievement”) – has a full-fledged Christmas Village set up. More than 50 festive booths have been erected, complete with traditionally carved window frames. Inside these booths, painted toys, warm mittens, gingerbread cakes and other seasonal delights can be found. Gentlemen may “rest ye merry” in many cafes offering tea, Christmas cinnamon-infused punch, or perhaps a shot of something stronger. Those inclined toward creativity can make their own handmade presents, with the help of special master classes that turn out tree decorations or ornaments for the festive table. Around the old VDNKh’s Friendship of the Peoples fountain, organizers are laying out an enormous ice rink that measures a total of 10,000 square meters (nearly 108,000 square feet). Even so, the rink will depend on the appearance of actual ice, and, so far, Moscow’s winter has been unseasonably mild. Unlike the other Christmas fairs, the Christmas Village at VVTs has been a hive of good cheer since Nov. 24. There is no such thing as starting a good thing too soon, it seems. 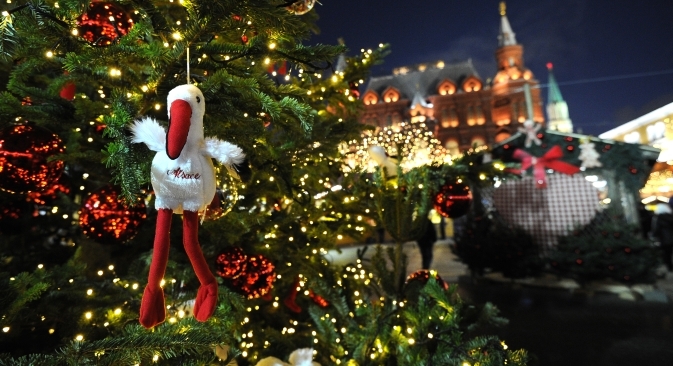 Another Christmas fair takes place from Dec. 22-30 at Sokolniki Park. Its organizers promise the real atmosphere of a European Christmas, with nods to the traditions of French, German, Belgian and Austrian Christmas markets. Not content with the usual range of yuletide novelties, visitors will be able to carry off crystal glass, furs and designer clothes from their shopping. Master classes for visitors also offer culinary mastery, sewing, ceramic floral design, and much more. The Sokolniki Park event also has a Farmer’s Cafe that serves organically grown produce from the areas around Moscow. More than 50 stands with different toys, ornaments, and handmade gifts were available, spread over the entire area of the Hermitage Gardens. Here, visitors could find cafes serving mulled wine, gingerbread, a skating rink, fun with snow, and sleigh-riding. Admission cost 350 rubles ($11) for adults, but children under 10 years of age were admitted free of charge.